From the beginning of this season, it was clear to see how important Juan Mata was going to be for Chelsea if they were to exceed the achievements of last season. The little Spaniard started the season off in fine form as Chelsea went to Wigan on the opening weekend. He looked very bright going forward with his close-touch football and skillful style of play. He was an instant hit, and all throughout the season, has been the catalyst and play maker for most of Chelsea’s attacks during games. He has even chipped in with goals and assists too, something which he has added to his game more. People may have expected summer signings Eden Hazard or Oscar to have more of an impact because of their stylish football backgrounds, but not many would have suspected Juan Mata to be so vital in what has turned out to be an up and down season for the West London side. It’s clear that Chelsea do look to be a completely different side when Mata isn’t on the pitch for them. They lack that final cutting edge or extra creativity that they sometimes need in order to pick a pass out or create a chance from very little to start with. It’s not that Chelsea rely on Mata, but they do rely on a player to be productive on the ball. Chelsea look to be a much better attacking side with Juan Mata, and for me, he should have a free role on the pitch to play on either wing or in the center of midfield as he is able to find a teammate in a dangerous position to kick start a move for his side. Not only are they a better attacking side with him on the pitch, but they do defend better, as he does help out his defense and makes up the numbers when the opponents are attacking. Juan Mata influences a game and team like only he can. He uses his pace, vision, and natural instinct to create something out of nothing for his team. He possibly makes them look like they are serious title contenders for next season and a very difficult side to play against. Playing alongside the likes of Frank Lampard, Eden Hazard, Oscar, and Ramires is something which Mata has thrived on this season. Lampard has helped him improve immensely this season because of his experience in tough situations for his club. Mata’s brilliant attitude to the game also brought back a lot of positivity to Chelsea during a difficult period in the season. He has since gotten better and better, and this talent hasn’t gone unnoticed either. He has developed into the player many thought he would become and has thoroughly settled into life in the Premier League. In doing so, he has become Chelsea’s main man this season. In Chelsea’s current campaign, he has already managed a very respectable 18 goals and 27 assists in all competitions, making him the club’s top marksman this season. This more-or-less just indicates his total importance to a Chelsea team who are currently in a time of transition. One game where you can look at his incredible influence is the win over Norwich City at Carrow Road back in December, where he got the only goal of the game in a hard fought victory. It was a rather lackluster performance from both teams as Norwich were set out to play for a draw, whereas for Chelsea it was a must win game for them. 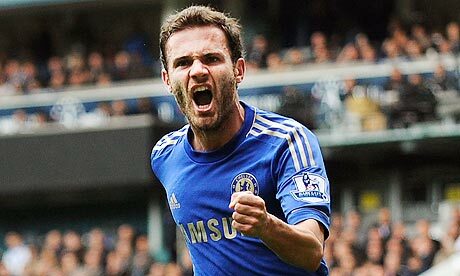 Mata provided a piece of brilliance to lighten the mood in the whole ground and break the deadlock. Another game would have to be Chelsea’s 4-0 away win over Stoke City where he provided 3 assists, although 1 of his assist lead to an own goal by Stoke striker Jonathan Walters. None-the-less, there is an ever-growing sign of importance for Juan Mata in this Chelsea team, and they look to be getting back on the right track and are ow picking up important results in competitions. He is developing and getting better and better as the season progresses, and very soon he could be considered as one of the best creators in the game. Chelsea will surely count their lucky stars so they keep him on their team. This may just be the start of something very special for Juan Mata and his career.